Congratulations to the field of Neuro Linguistic programming for being 40 years in existence. 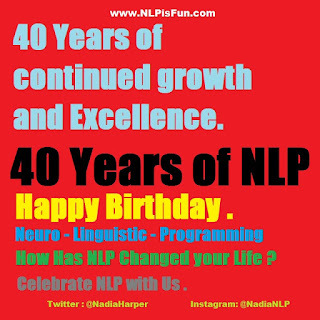 NLP is my passion and ongoing and ever expanding technology of choice as an Interviewer - Trainer - Coach - Speaker - People Developer - Communicator -Blogger - Vlogger - High achiever - Life Conqueror and everything else in between. Using NLP has given me a set of tools that compare to none and a constant drive to improve and question "what is real to me or to them, and how is reality being constructed in this context anyway". This is an extremely powerful concept because it presents the opportunity that what we see does not have to be what we get. There is so much more for us to discover about how we present reality, what this means, why we have decided that, would we like to change it and if so what will be the best way for each individual. Then testing, tweaking and achieving in great strides that seem ridiculously easy from the other side. We can do all of this and so much more. We have the absolute advantage with this technology. We must treat it as an exploration, this information will expand as much as we would like it to. we are improving NLP for each of our use, we are adding to it's benefit as we learn about it and what else is possible for each of us. Becoming a Practitioner of NLP opens a persons eyes and perhaps starts the journey and the relationship. Becoming a Master Practitioner, begins to take NLP to an advanced level of knowledge and Know how, Introducing even deeper concepts of personal transformation and directional life and business mastery. This however certainly is not the That is it I know it all know! That some may think it is and neither is becoming a Trainer of NLP. 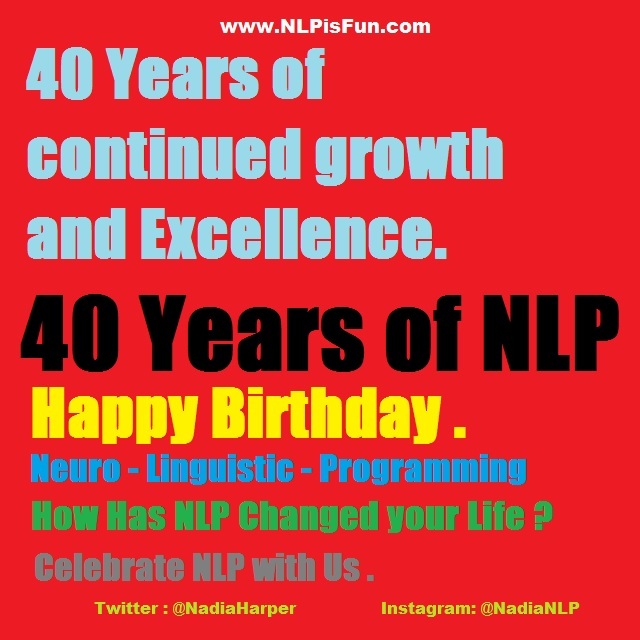 The journey of NLP is an ongoing conversation and one that never ends, it certainly is best learned through personal application which is an attitude, a daily commitment to using this tool set to gain richer and more powerful living. How has NLP changed your life experience ? I Invite you to take the time to discover what you really have learned about yourself, since your association with NLP.